Hollywood and Georgia Power collide for the creation of an Oscar-contending film from Universal Pictures. The film, First Man, based on the book by James Hansen, is a biopic of Neil Armstrong’s journey to become the first man to walk on the moon in 1969. The critically acclaimed movie, packed with a lineup of stars including Ryan Gosling, Claire Foy, and Academy Award-winning director Damien Chazelle (La La Land), needed a Georgia location that could double as a NASA launch facility. Plant Scherer was ready for lift off. The search for a film location started with an email from Hollywood location scouts to Mike Staples, film coordinator for Georgia Power property and member of the engineering department in Community & Economic Development. The scouts knew their director, Chazelle, was committed to making this film as authentic as possible. He wanted to avoid computer generated, green screen technology, build first-scale replicas and receive on-set direction and advice from real NASA veterans who are now in their 70s and 80s. So, the scout’s initial request included a search for buildings with industrial beams and an outside elevator. They needed a structure that could imitate NASA’s Cape Canaveral launch facility. To fill the request, Georgia Power’s film team responded with power plants such as Yates, McDonough and, ultimately, Scherer. The director’s team of 50 production crew and scouts toured the all of the plants before choosing Scherer. The filming at Plant Scherer took place in December 2017, with several hundred members of the film crew on site each day, including actors, directors, cinematographers, set designers, consultants, extras, additional security, location scouts, caterers and more. Open spaces near the plant were quickly transformed into large catering facilities, production trailers, actor dressing rooms, parking lots, equipment storage, and areas for antique 1960s trucks and cars to reside. A steel cat walk was constructed on the plant roof by the production crew. It served as an exact replica of the gantry swing arm the Apollo astronauts walked across just before boarding their rocket for a trip to the moon. The set was painted to look as if it was covered in many years of paint, weather and dirt. 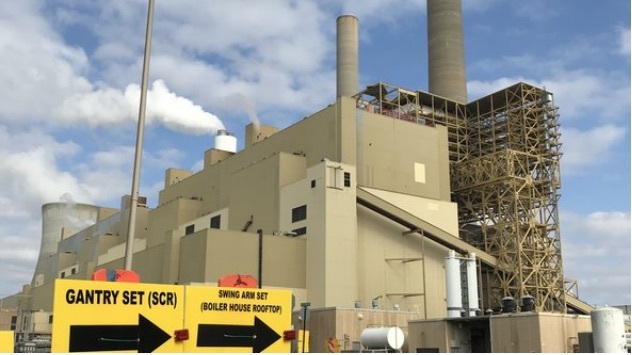 The Georgia Power film team and management from Plant Scherer were both on-site ensuring support, safety and oversight. The groups were impressed by the film team’s commitment to placing safety first. Kyle Hinshaw, lead location manager for the Universal Pictures production team, could not have been more appreciative of the company’s assistance. He commented on how smooth the Georgia Power team made everything at the site during preparation, filming and clean-up. Since 2009, Georgia’s lucrative 30% tax credit for film has boosted the state to first place for feature films last year and attracted $9.5 billion in economic impact. Since 2011, Georgia Power has supported the filming of more than 40 films and television shows across the state and assisted locating films for many other communities. The company is committed to partnering with the state to grow Georgia across all target industries, including film, and create a stronger, more vibrant future for all Georgians. The filming at Plant Scherer was a complicated request to duplicate the 1960s look of Cape Canaveral’s rocket launch facility. 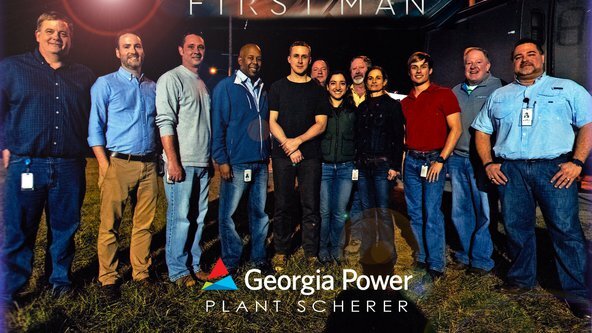 When First Man debuts October 12th in theaters, Georgia Power employees should feel proud that they played a part in bringing this history to life.